We will discuss the drum instruction and look at an example of controlling traffic lights with a cross walk signal. Continue Reading! Math instructions are used to perform mathematical calculations. 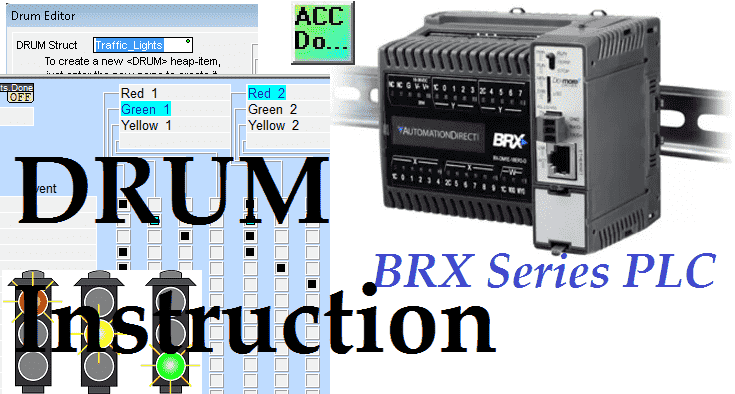 The BRX PLC has math instructions that can be used in a wide variety of applications. We will be looking at the INC increment, DEC decrement, LERP linear Interpolation, RANDSEED Random Number Seed and the MATH Calculated Expression instructions. Your automation system that you implement may involve some or all of these instructions. As a system integrator you will require the use of these instructions in your commissioned programs. Let’s get started with the BRX PLC Math Instructions. Continue Reading! The BRX series of programmable logic controllers has built in high speed inputs and outputs. Every CPU will have either 6 or 10 high speed inputs (HSI) available depending on the model. These inputs can be used for input frequencies from 0 to 250Khz. 250Khz represents 250000 input counts per second that can be coming from devices connected to your PLC like an encoder. Every BRX CPU unit also has 2, 4 or 8 high speed outputs (HSO) available depending on the model. The outputs can send a frequency of pulses out up to 250Khz. Due to the speed of the IO, these functions available on the BRX PLC will operate asynchronous with the PLC scan time. We will be looking at sending an output of pulses at different frequencies from our BRX PLC and inputting these back into the high speed inputs of the PLC. So our output will be wired back into our input. We will then display the frequency of the input pulses and the count. As a system integrator, this ability to send and receive high speed inputs and outputs can prove very useful to you in the field when commissioning your automation system. Let’s get started with the BRX PLC High Speed IO. Continue Reading! Let’s get started with the BRX PLC Counters. Continue Reading! We will be looking at the addressing and numbering systems in the BRX Series PLC. Let’s get started. Continue Reading!